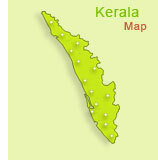 Thrissur is a city situated in the central part of Kerala state, India. It is an important cultural centre, and is known as the "cultural capital" of Kerala. It is famous for the Thrissur Pooram festival, the most colourful and spectacular temple festival of Kerala. The festival is held near the Vadakkumnathan temple, in April or May. It has a large number of well known temples around, including the temple town of Guruvayoor. The name Thrissur is derived from 'Tri-Shiva-Perur', which means the place with three famous Siva temples which are said to be 1)the Vadakkunathan, 2) Kottapuram Siva temple and 3)Punkunnam Siva temple. (Alternately, the name can be parsed as 'Thiru-Siva-Perur', the place with the holy name of Siva). Thrissur was also known as Vrishabhadripuram and Ten Kailasam in ancient days. From ancient times, Thrissur district has played a significant part in the political history of south India. The early political history of the district is interlinked with that of the Cheras of the Sangam age, who ruled over vast portions of Kerala with their capital at Vanchi. The whole of the present Thrissur district was included in the early Chera empire. The district can claim to have played a significant part in fostering the trade relations between Kerala and the outside world in the ancient and medieval period. It can also claim to have played an important part in fostering cultural relations and in laying the foundation of a cosmopolitan and composite culture in this part of the country. Kodungalloor which had the unique distinction of being the 'Premium Emporium India', also belongs to the signal honour of having first given shelter to all the three communities which have contributed to the prosperity of Malabar. These three communities are the Christians, the Jews and the Muslims. The history of Thrissur district from the 9th to the 12th centuries is the history of Kulasekharas of Mahodayapuram and the history since 12th century is the history of the rise and growth of Perumpadappu Swarupam. In the course of its long and chequered history, the Perumpadappu Swarupam had its capital at different places. According to the literary works of the period, the Perumpadappu Swarupam had its headquarters at Mahodayapuyram and had a number of Naduvazhies in southern Kerala. Central Kerala recognised the supremacy of the Perumpadappu Moopil and he is even referred to as the 'Kerala Chakravarthi' in the 'Sivavilasam' and some other works. One of the landmarks in the history of the Perumpadappu Swarupam is the foundation of a new era called Pudu Vaipu era. The Pudu Vaipu era is traditionally believed to have commenced from the date on which the island of Vypeen was thrown from the sea. The 14th and 15th centuries constituted a period of aggressive wars in the course of which the Zamorins of Calicut acquired a large part of the present Thrissur district. In the subsequent centuries the Portuguese dominated the scene. By the beginning of the 17th century the Portuguese power in Kerala was on the verge of collapse. About this time other European powers like the Dutch and the English appeared on the scene and challenged the Portuguese. Internal dissension in the Perumpadappu Swarupam helped the Dutch in getting a footing on the Kerala coast. As the Kerala chiefs were conscious of the impending doom of the Portuguese, they looked upon the Dutch as the rising power and extended a hearty welcome to them. The decadence and consequential want of solidarity opened the flood gates of aggression. Hyder Ali and Tippu Sultan figured very prominently during the period. In 1790 Raja Rama Varma (1790-1805) popularly known as Sakthan Thampuran ascended the throne of Cochin. With the accession of this ruler the modern period in the history of Cochin and of the district begin. Sakthan Thampuran was the most powerful maharaja as the very name indicate. He is the architect of Thrissur town. Sakthan Thampuran ascended the throne just before the conclusion of a treaty with the British East India Company. According to that treaty, Cochin threw off all allegiance to Tippu Sultan and became a tributary to the Company. The wave of nationalism and political consciousness which swept through the country since the early decades of this century had its repercussion in the district as well. Even as early as 1919 a committee of the Indian National Congress was functioning in Thrissur. In the Civil Disobedience Movement of 1921, several persons in Thrissur town and other places in the district took active part and courted arrest. Thrissur district can claim the honour of having been in the forefront of the countrywide movement for temple entry and abolition of untouchability. The famous Guruvayur Satyagraha is a memorable episode in the history of the National Movement. The Government of Cochin under the guidance of Sri. R. K. Shanmughom Chetti followed a policy of conciliation. By decree the public demand for the introduction of responsible Government in the State grew strong. In August 1938 Cochin announced a scheme for reforming the State legislature and introducing a system as per the Government of India Act of 1919 in the British Indian provinces. The administration of certain departments was entrusted to an elected member of the legislature to be nominated by the Maharaja. In the elections to the reformed legislature two political parties, viz. the Cochin State Congress and the Cochin Congress won 12 and 13 seats respectively. With the help of a few independents Ambat Sivarama Menon who was the leader of the Cochin Congress Party took up office as Minister under the scheme in June 1938. On his death in August 1938 Dr. A.R. Menon was appointed as Minister. When the State Legislature passed a vote of non-confidence against him, Dr. Menon resigned office on February 25,1942 and was succeeded by Sri T.K. Nair who continued in office till July 11,1945. The introduction of dyarchy did not satisfy the political aspirations of the people of Cochin. The idea of full responsible Government on the basis of adult franchise had caught their imagination. On January 26, 1941 a new political organisation called the Cochin State Praja Mandal took shape on the initiative of a few young politicians under the leadership of V.R. Krishnan Ezhuthachan. The Quit India Movement of 1942 had its echoes in the district. After the release of the leaders from jail in 1943, the Cochin State Praja Mandal pursued its organisational activities more vigorously. In the elections to the State Legislature in 1945 it won 12, of the 19 seats contested by its candidates. At the annual conference of the Praja Mandal held at Ernakulam in 1946 it was decided to start a state wide movement for the achievement of a responsible Government. The State Legislature was scheduled to meet on July 29, and it was decided that the day should be observed all over the State as 'Responsible Government Day'. In pursuance of this decision, meetings and demonstrations were held all over the State demanding the end of Dewan's rule and the transfer of full political power to the elected representatives of the people. The Maharaja of Cochin announced in August 1946 his decision to transfer all departments of the State Government except law and order and finance to the control of Ministers responsible to the State Legislature. In co-operation with other parties in the State Legislature, the Cochin State Praja Mandal decided to accept the offer. Consequently the first popular Cabinet of Cochin consisting of Panampilli Govinda Menon, C.R. Iyyunni, K. Ayyappan and T.K. Nair assumed office. The first step towards the achievement of the goal of 'Aikyakerala' was taken with the integration of 'Travancore Cochin' States in July 1949. With the linguistic reorganisation of States in India, in November 1956 the Kerala State came into existence. Area : 3032 sq km. Kunnamkulam, Trissur, Chalakudy, Iringalakuda, Guruvayur, Chavakkadu, Kodungallore. Archaeological Museum (Town Hall Road) Open from 1000-1700 hrs on all days except Mondays and national holidays. Zoo (2 km from Thrissur town) Open from 0900-1700 hrs on all days except Mondays. Art Museum is located in the Zoo compound. The art museum displays collections of wood carvings, metal sculptures and ancient jewellery. (Open 1000-1700 hrs on all days except Mondays). Town Hall Houses the Pictures Gallery where mural paintings from all parts of Kerala are on display. Aquarium is near Nehru Park (open 15:00-20:00 hrs). Vilangankunnu (7 km from Thrissur) is a beautiful hill which is a good picnic spot. Arattupuzha This village is known for the annual Pooram festival at the temple in April/May. The uniqueness of this festival is the ceremonial processions carrying the images of the deities of 41 neighbouring temples to this village. Peechi dam (23 km east of Thrissur) is a fascinating picnic spot offering boating facilities. There are frequent private buses from Thrissur to Peechi dam. Christian Divine Retreat Centres They are located at Muringoor and Potta near Chalakudi, on the Kochi - Thrissur route. Cheruthuruthy (32 km north of Thrissur) is the seat of the Kerala Kalamandalam, renowned the world over for its Kathakali training centre. The music and dance academy was founded by the famous poet, Vallathol Narayana Menon. 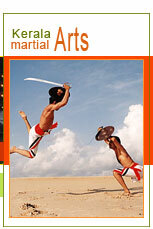 Training in Kathakali, Mohiniyattom, Thullal and other art forms of Kerala is imparted here. Athirapally (63 km from Thrissur) At the entrance to the Sholayar ranges, this 80 foot high waterfall is a popular picnic spot. Vazhachal (68 km from Thrissur) Just a short drive from Athirapplly, this picturesque waterfall is close to dense green forests and is a part of the Chalakudy river. Athirapally and Vazhachal are the most famous waterfalls of Kerala and favourite destinations of tourists. Shakthan Thampuran Palace Also known as Palace Thoppu, the campus covers an area of 6 acres. Here you can see 3 shavakudeerams (tombs) including that of the renowned Shakthan Thampuran. Saint Thomas Memorial, Kodungalloor St. Thomas is believed to have landed in Kodungalloor (formerly called Muziris) in 52 AD. The St. Thomas Church established by the apostle houses holy relics from the olden days. Cheraman Juma Masjid, Kodungalloor Located 2 km from Kodungalloor town, this mosque resembles a Hindu temple in appearance. Built in 629 AD, this is the first mosque in India and the second in the world where Juma prayers were started. Other places of interest nearby include Cheramanparambu, the ancient Thiruvanchikulam Temple, the Bhagavathi Temple and the Portuguese fort. Vadakkumnathan Temple One of the oldest temples in the State, the Vadakkumnathan temple is a classical example of the Kerala style of architecture and has many decorative murals and pieces of art. It is faced with elegant architectural styles which have towering gopurams. The comparatively low, tiled roofs and the liberal use of wood harmonize with the natural environment. The frescoes and carvings on the walls depict the stories from Mahabharata. This is the venue of the world famous Pooram festival celebrated annually in April-May. The fireworks at the Pooram are a spectacular sight. Non Hindus are not allowed entry into the temple. The Vadakkunnathan Kshetram, where the reigning deity is Lord Shiva, is situated on a hillock in the heart of the town. Left to the entrance is Koothambalam or theatre hall, a remarkably beautiful structure with an elegant sloping roof of metal plates. Within this is staged the ancient dramatic art form of Chakyar Koothu. Within the main shrine resides Vadakkunathan or Lord Shiva, represented by a Mahalingam. This however cannot be seen because the traditional offerings or 'abhishekha' with cow's ghee over several decades, and in fact centuries, have formed a large 3-metre-mound around the lingam. Miraculously even the warm tropical climate of Kerala does not melt, or in any way spoil it. It is believed that a part of the ghee is as much as a thousand years old, and is in great demand by Ayurvedic doctors who require old ghee for their herbal preparations. Tiruvilluamala shrine, Kerala's most important temple dedicated to Lord Rama, is 29 kms from Trichur. Another temple dedicated to Lord Rama, the Triprayar Temple is south of Trichur. It has exquisite wood carving and sculptures. The only temple in India, dedicated to Lord Rama's brother, Bharata, is the Kutalmanikyam temple in Trichur district. The waters of this temple tank are said to have curative powers. India's most ancient mosque, Cheraman Jama Masjid and an old Shiva temple Thiruvanchikulam kshetram and Kodungalloor Bhagawati kshetram housed here. Guruvayoor ( 29 km west of Thrissur ) is one of the most sacred and important pilgrim centres of Kerala. Its main attraction is the Shree Krishna temple. This historic temple is shrouded in mystery. According to belief, the temple is the creation of Guru, the preceptor of the Gods, and Vayu, the God of winds. The eastern nada is the main entrance to the shrine. In the Chuttambalam (outer enclosure) is the tall 33.5 m high gold plated Dwajasthambam (flag post). There is also a 7 m high Dipastambham (pillar of lamps), whose thirteen circular receptacles provide a truly gorgeous spectacle when lit. The square Sreekovil is the sacred sanctum sanctorum of the temple, housing the main deity. Within the temple there are also the images of Ganapathy, Lord Ayyappa and Edathedattu Kavil Bhagavathy. Only Hindus are allowed inside the temple. Rail : Thrissur is an important railhead of the Southern Railways. Road : Thrissur is well connected with almost all the major towns and cities of India. There are three major bus stations operates long distance KSRTC bus station, near the railway station operates long distance and interstate services. Sakthan Thampuran bus stand is 1 km away from town. The north bus stand is in the heart of the town.